I’m still hiding out up in Santa Monica, but was dragged in to work at 2:30 AM; when I left at 9 AM I decided to stop by Old Marineland to make a cameo appearance. Reports from yesterday said that conditions sucked, so I wasn’t really expecting many, if any, divers. Bringing a snack tray and a 12 pack of the King Of Beers, I was quite surprised to see at least six familiar divers’ vehicles. 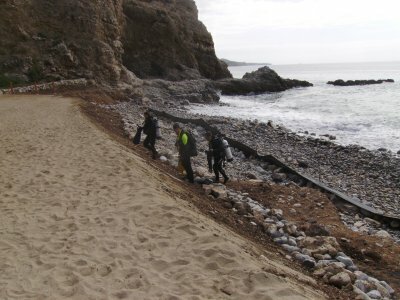 Apparently, the County of Los Angeles made Terranea Resort officially “close” the trail down to the Cove (i.e. “The Sandy Beach”) due to storm damage and safety reasons, but the obstacles are easily bypassed and nobody seems to care if you’re on the trail. Conditions on the surface looked like the diving sucked. Most of the regular divers had made an exit, but the group was waiting for the remaining divers coming in from 120 reef. The shore was getting hit occasionally with some pretty nasty looking waves, so I grabbed my camera and filmed their exits. Everybody made a boring exit, thank God. However, a diver did drop his fin; if you find it, call the number written on it and offer to sell it back to him. The shoreline has been rearranged by the recent storms – there is quite a ridge between the rocks and the sand. Nothing like climbing a sand dune in SCUBA gear! Dennis G. and Donna The Hot Biker Chick. Well, the consensus report is, “the diving sucked,” but nobody expressed any regret getting wet. The Easter Egg dive is coming up on April 16th; I’m hoping to get back in the water by then as I am still congested from the cold that never goes away. Thanks Jeff but you over estimate my willingness to buy back abandoned equipment. I will howerver gladly provide the beverage of choice to the lucky finder of said fin. Tusa Expert (term used loosely) Zoom, black and silver. good to see there are people diving, I myself have been sitting out. 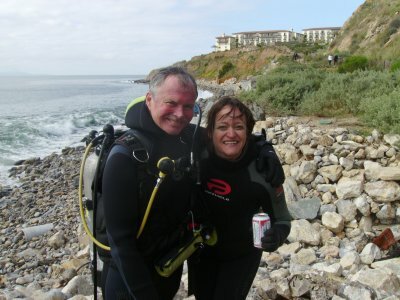 But I hope next week to get back into the water thur night at Redondo canyon to look for some fresh Halibut dinner. Last year at this time the fish were in the shallows, hope conditions get better.